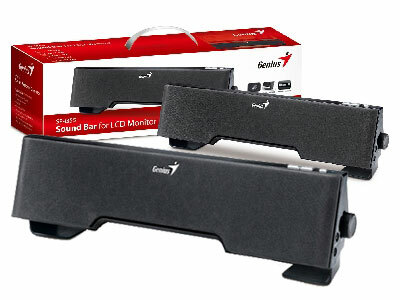 For clear, beautiful sounds, the Genius SP i355 soundbar speaker for LCD monitors is just what the doctor ordered. Sleek and compact enough to fit under most 19-inch LCD monitors, the Genius SP i355 one-piece speaker system has been ergonomically designed to take up only but a small amount of space. This makes it ideal for audiophiles who do not have a lot of desk room to spare. The speaker features two detachable stands so it can stand on its own. Its unique water resistant cloth casing ensures that the speaker can endure unwanted coffee spills around the area. With two 2" five-watt unit drivers and two 2" passive drivers-a total of audio output of 10 watts-the Genius SP i355 is infinitely better than what your built-in LCS speakers can dream to offer. Volume and tone control is very easy with its control buttons and wheels readily accessible on the speaker's right side. A headphone jack is also available for your private listening pleasure.